Anterior cervical spine surgery is one of the most common spinal procedures performed around the world, but dysphagia is a frequent postoperative complication. Many factors have been associated with an increased risk of swallowing difficulties, including multilevel surgery, revision surgery, and female gender. 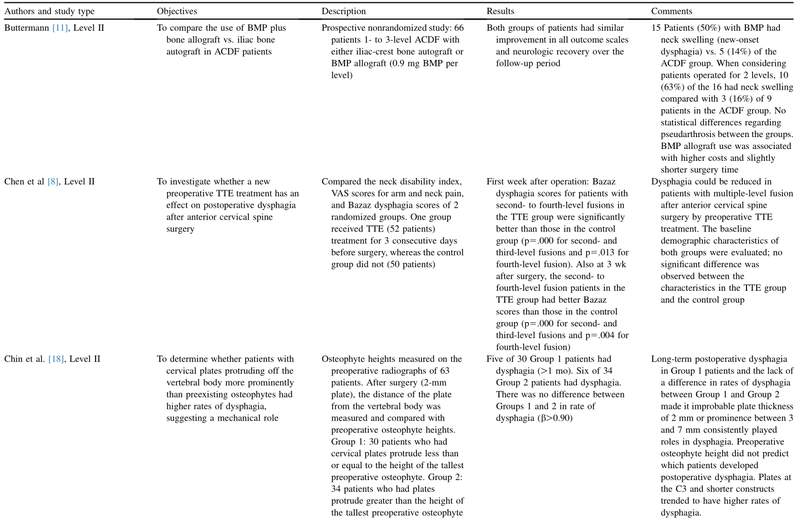 The objective of this study was to review and define potential preventative measures that can decrease the incidence of dysphagia after anterior cervical spine surgery. This was a systematic literature review. A systematic review in the Medline database was performed. Articles related to dysphagia after anterior cervical spine surgery and potential preventative measures were included. Twenty articles met all inclusion and exclusion criteria. These articles reported several potential preventative measures to avoid postoperative dysphagia. Preoperative measures include performing tracheal exercises before the surgical procedure. Intraoperative measures can be summarized as avoiding a prolonged operative time and the use of recombinant human bone morphogenetic protein in routine anterior cervical spine surgery, using small and smoother cervical plates, using anchored spacers instead of plates, application of steroid before wound closure, performing arthroplasty instead of anterior cervical fusion for one-level disease, decreasing tracheal cuff pressure during medial retraction, using specific retractors, and changing the dissection plan. Current literature supports several preventative measures that may decrease the incidence of postoperative dysphagia. Although the evidence is limited and weak, most of these measures did not appear to increase other complications and can be easily incorporated into a surgical practice, especially in patients who are at high risk for postoperative dysphagia.